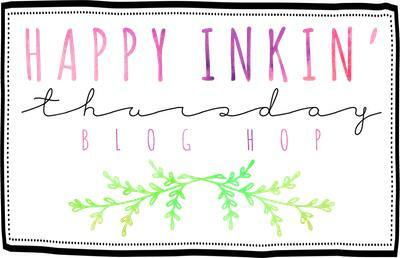 Here’s the Blog Hop badge – just so you know it’s for real! 🙂 Thanks, Amy, for the fun challenge! I started with some Petal Passion DSP and matted it on a panel of Bermuda Bay card stock. I wrapped a piece of Bermuda Bay Shimmer Ribbon – from the Shimmer Ribbon Pack in the Sale-A-Bration flyer (yes – you can get three rolls of Shimmer Ribbon – one each in Bermuda Bay, Basic Gray and Calypso Coral with a $50 purchase!) – around the panel securing it in the back with a little bit of Fast Fuse. For the middle panel – where the sentiment is located – I took a Basic Black panel, embossed it in the Simple Stripes TIEF, and matted it on Bermuda Bay. Then I Fast Fuse’d it over the ribbon on the card front. I cut the sentiment with the Large Letters Framelits from a piece of shimmery paper in the Myths & Magic Specialty DSP. I also cut two more of each letter/punctuation from Basic Black card stock, stacked them all up with Liquid Glue and adhered them to the card front. I picked another piece of the Petal Passion DSP and colored some flowers with my Light and Dark Pool Party and Bermuda Bay Stampin’ Blends, then fussy cut them. I adhered them to the card front with Liquid Glue and a Stampin’ Dimensional. Finally, I added a Pearl Basic Jewel to each flower and the card front was done! On the inside, I stamped a sentiment from the All Things Thanks stamp set (using my Stamp-A-Ma-Jig) in Bermuda Bay on a Whisper White panel. In the corner, in Basic Black Archival Ink, I added the large and lovely flower from the Petal Palette stamp set and colored it with my Pool Party and Bermuda Bay Stampin’ Blends. I Fast Fuse’d the panel to a Bermuda Bay mat and into my Thick Whisper White card base, popped the card front on with Stampin’ Dimensionals and the card was done. …and added a little more of the Petal Passion DSP to the envelope flap. Et Voila! The Large Letters Framelits are one of those tools that, like your KitchenAid stand mixer, you might not use every day. Or even every week! But – when you need it – you need it and it’s good to have it at the ready. Of course, the Petal Palette stamp set and the coordinating Petal Passion DSP, from the 2018 Occasions Catalog is a heavy favorite! I hope you like! So glad that you liked the color challenge with the “open box” for whatever you wanted. 🙂 Such a cute card! Love the die cut letters from the DSP. Great layers too! I sure did!! Thanks so much, Amy! Isn’t that Myths & Magic DSP pretty?!? What a fun card! It is sure to make someone’s day brighter. Love your color choice with the b/w, too. And yes, there are some things in life that we don’t use every day, but when we need it, we NEED it. And I LOVE my Kitchen Aid stand mixer. Love the colors and those happy flowers and big letters. TFS. So bright and fun. Those letters just pop on that black background!!! So fun. I love how you chose Bermuda Bay as your third color! Great card and love the pop of color. Fresh and fun! Great colour choice Mary… so bright and fun. Love your creation.